Your website isn’t driving as much traffic as you’ve expected? Does it have high bounce rate compared to its conversion rate? Time has come when you should think about redesigning your website. Don’t forget that your website creates first impression upon your audiences’ minds. And, your audience ran out of time. If they don’t get proper information about their queries from your website within the first few minutes, they won’t waste their time to navigate other pages of your website. If you delay website redesigning, you’ll lose your business day after day. There are multiple red flags that are emphasizing on the need to invest in a web designing right now. 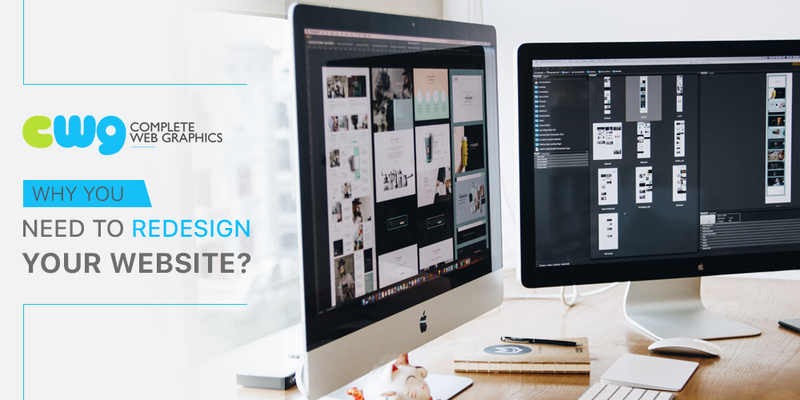 Why should you consider Website Redesign? Not Bringing Enough Traffic: Does your website look professional and simple? Is it pixel-perfect? Great! Still, if it is not giving you positive results, there’s something wrong with its design. Your website strengthens your customer base. The analytics should always show that your visitors and sales are increasing. Below-the-Level Performance: You surely have come across websites that are not user-friendly. Such a website fails to generate sales. Near about 88% of customers don’t return to the sites that appear confusing and slow to them. You know why it is so. Make sure that you’ve a user-friendly website. When certain features of your website are not working optimally, your visitors skip to other sites. Is my website efficiently solving my audiences’ queries? Can the visitors navigate my site easily? The answers to these questions will help you to learn the ways through which you can enhance the performance of your website. Not Responsive: According to Google, 61% of users don’t come back to sites that are not mobile-friendly. It means if your users find it difficult to access your site from their mobiles, they will start looking for the information in your competitor’s site. And, that you don’t want, right? Once you’ve made your website mobile-friendly, the users won’t have to zoom the content to see it clearly. Your website will automatically fit into the pixel-width of broad range of platforms. After you’ve learnt the importance of a responsive website, your next search will be how to make it. Choose a fluid grid that can adjust its dimensions according to the device’s screen. Make sure your website works perfectly with both touchscreen and the mouse. Optimize your images so that they won’t add to the weight of the website much. Re-framed Your Strategy: According to some reputed web designing service providers in Kolkata, proper planning is vital to redesign website. Once you know what you want from your website, you’ll design it accordingly. This, in turn, will help you to meet the unique needs of your current users. Most of the big brands have a separate team to look after the changes that their websites need. They adopt iterative approach to take care of every detail related to the websites. Make certain that the changes you’re making in your website have definite purposes to serve. You should know why you’re introducing those changes and whether they’re serving your purpose successfully. Not Optimized for Search Engines: You may have used urls or templates for your website. As a result, your website is likely not to be SEO-friendly. When you think of redesigning your website, you’ve to work on its back-end, like editing the coding etc. You’ll also need to improve your custom page urls, alt tags, page titles, and H1, H2, and H3 tags. To do all these, you need to redesign your website on an advanced CMS platform that comes with great flexibility. Count on the factors discussed below while making your website SEO-friendly. Use only SEO-friendly and clean codes. Integrate your site with social media platforms. Built on Outdated Technologies: How old is your website? If it ages more than 4-5years, rebuild your website using the latest technology. Using flash in your website? Well, then it will be slightly tough for you to rank your website. It’s because websites using flash cannot be accessed easily through mobile devices. Besides, if you’re using old plugins, update them to enhance the performance of your website. Not Sufficiently Secured: Cyber crime is increasing at an alarming rate. If your website is not following the international security measures, it will soon become a victim of hackers. Check whether your payment page is encrypted. The chances of being attacked by malware and hackers are more when your website is old enough. Peek at the points shared below while increasing your website’s security. Doing these tasks may be bit tough for you. That’s why, we recommend you to hire a professional like Complete Web Graphics. With their years of experience in website designing, you’ll be relaxed and get a website that is bringing in huge traffic. Click on www.completewebgraphics.com to discuss your project with them.